Allsport Performance Inc. is not a warranty repair station. We make no express or implied warranty whatsoever with respect to any merchandise, including but not limited to the implied warranties of merchantability and fitness foe a particular purpose. The only warranties provided are provided by the manufacturers and are as contained in each manufacturer's package. FIREARMS, AMMUNITION, MAGAZINES, OPTICS, LASERS, RED DOTS, FLASHLIGHTS, GENERAL ELECTRONIC ITEMS, USED ITEMS, CLEARANCE ITEMS, and KNIVES CANNOT BE RETURNED. All other returns must accompany a receipt, in original package and in new condition. NO returns after 15 days for any reason. A CURRENT VALID STATE OF MAINE DRIVERS LICENSE OR STATE PICTURE ID IS REQUIRED FOR ALL OF THOSE WHO PURCHASE A FIREARM THROUGH US. PLEASE MAKE SURE THEY HAVE YOUR CURRENT PHYSICAL ADDRESS ON THEM AND THEY ARE NOT EXPIRED. 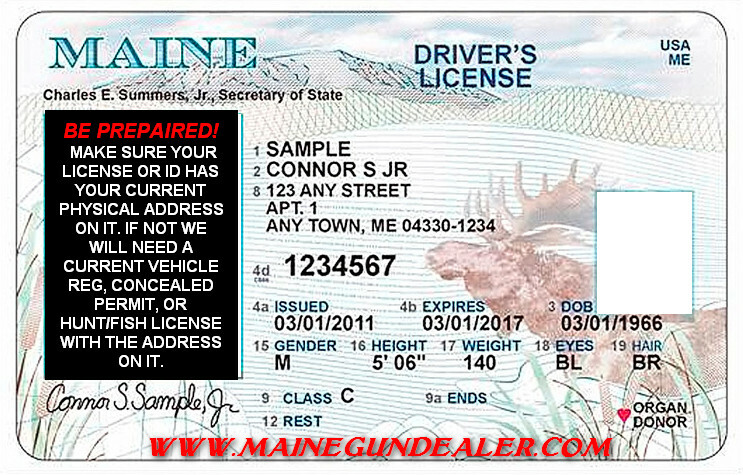 IF NOT YOU WILL NEED A CURRENT MAINE VEHICLE REGISTRATION, CURRENT VALID MAINE RESIDENT HUNTING LICENSE, CURRENT VALID MAINE TEMP DRIVERS LICENSE (ONLY IF YOUR ORIGINAL DRIVERS LICENSE OR STATE PHOTO ID IS NOT EXPIRED) OR CURRENT VALID MAINE CONCEALED WEAPONS PERMIT WITH YOUR CURRENT PHYSICAL ADDRESS ON IT (Must have photo). NO PO BOXES. We do not sell to non residents of Maine or Non US citizens. Our policy requires that you must be Maine resident and a United States citizen for us to sell or transfer a firearm to you. Not a Maine resident or US citizen? : We do not do sell firearms or offer firearm transfers to non residents of Maine or Non US citizens. Our policy requires that you must be Maine resident and a United States citizen for us to do a transfer or sell a firearm. We do not accept immigrant visa's, Alien, or Admission numbers. DELAYED: If the background check status is delayed. You must pay for the firearm in FULL or the firearm will not be held. If we get a proceed answer on your background check we will call you to come pick up the firerarm. If we do not receive an answer see below. We use the Brady Transfer Date for delayed background check with no response. We have the right transfer on the Brady Transfer date or not to transfer at all. - If the FFL has not received a final determination from the NICS when the Brady transfer date arrives, it is within the FFL’s discretion whether or not to transfer the firearm (if state law permits the transfer). If the FFL transfers the firearm, the FFL must check “no resolution was provided within three business days” on line 21d of the ATF Form 4473. Some customers get delayed when it is their first firearm purchase, some are delayed randomly, and some get delayed everytime, and many never get delayed. The results are the same whether the background check is called in or done online. All used firearms or other used merchandise is inspected and cleaned by our staff to insure its "safe" and dependable functionality. All used merchandise is sold "as is" and no warranties are made. Purchasers of used firearms are urged to contact the manufacture for a firearm owners manual for such firearm. We recommend all guns be checked by a professional gunsmith before firing. The used firearms have not been test fired by us. See our USED GUN GRADING page by clicking here or the link on our home page. CASH / DEBIT / CREDIT. 3% DISCOUNT ON NEW AND USED FIREARMS WHEN PURCHASED WITH CASH. SORRY NO CHECKS!! We offer a low profit margin on firearms. While other shops say they mark up firearms a certain percentage across the board we other fixed profit margins. We mark up our firearms from $25 to $50 dollars in most cases with most middle of the road guns marked up $40. That is roughly 20% on on the lowest priced items and as low as 5% on more expensive firearms. Yes our profit margin goes down as the price of the firearm goes up. If paying cash the item must be paid in full before we order it. If paying by credit or debit the item must be paid in full before we order it. This policy is due to guns that have been orded and never picked up or guns that have sat here for a very long time before being picked up with only a small portion of money down. Returns on special orders (non firearms) will be subject to 25% restocking charge. We do offer a cash price on special orders. MOST ORDERED FIREARMS WILL ARRIVE IN 3-7 DAYS. Ordered firearms should be picked up within 7 day of us receiving it. If ordering a firearm by phone you must pay by credit card or via Paypal in full before we order it. In order to get a cash price on an ordered firearm by phone you must send a USPS money order via mail prior to us ordering the firearm. We do not accept personal checks. Returns on special orders (non firearms) will be subject to 25% restocking charge. We do not offer a cash price on special orders over the phone. MOST ORDERED FIREARMS WILL ARRIVE IN 3-7 DAYS. Ordered firearms should be picked up within 7 day of us receiving it. Yes we offer gift certificates. If you pay cash for the gift certificate it will count as cash at check out. If you used a credit or debit card it will not be used as cash at check out. You must use the full amount of the gift certificate if the buyer used credit or debit. This is something I do record. To transfer a firearm from another dealer outside the state of Maine, we charge a fee of $20.00 cash $25.00 CC per firearm. There is an additional fee for the transfer of more that one handgun within 5 working days. PLEASE SCROLL DOWN FOR MORE INFORMATION ON TRANSFERS. Active duty military transfer fee $15.00 cash $20.00 CC per firearm. See our FFL Transfer page for more info by clicking here or using the link on our home page. You must be 18 years old to purchase rifle or shotgun ammunition and must be over 21 to purchase pistol ammunition. ID is required. You will need to be 18 years old to purchase a knife and ID is required. You will need to be 21 years old or older and a Maine resident to purchase. You will need to be 18 years old or older and a Maine resident to purchase. You will need to be 21 years old or older and a Maine to purchase. For safety purposes and resale value we do not take any guns in for resale that have been modified. Such as trigger upgrades and other internal or external upgrade to improve the mechanical performance of the gun. TRADING IN A FIREARM? Please note when considering trading in a firearm we do not take in every firearm that walks in th door. It depends on what we have in stock, if it is a hard to sell model, a firearm that is known to have problems or a recall, the time of year, and the condition of the firearm. Firearms that we are highly likely to take in are old, antique, vintage, or military firearms. Older lever action rifles. Older Colt, Ruger or Smith revolvers. Pre 64 firearms. We do take newer production firearms but it depends on what you have. WE DO NOT BUY modern muzzleloaders, reproduction firearms, sporterized firearms, firearms with upgraded or modified triggers, AR15's or AR10's that are not factory made (No individually made, locally or non locally made custom AR's), handguns with stippled or modified frames, firearms with non factory Cerakoted or Duracoated finish, Jennings firearms, Bryco firearms, Benelli firearms, Stoeger firearms, reloaded ammunition, used optics or bows please*** (We only make exceptions when buying estate collections) When dealing with buying estate collections we will buy them all. We will not hold any firearm until a cash deposit it made on the firearm. (we will not hold firearms by phone) We will not hold a firearm more than 7 days. If it is longer than 7 days then you would need to go through our layaway plan. PLEASE CLICK HERE TO SEE OUR LAYAWAY POLICY or see the link on our home page. If you have a long drive to get here and you want a firearm held for the length of time it will take you to get here we can do that. Call, message through Facebook, or email us. We will not hold a firearm more than 4 hours. 4 hours should be sufficient for travel from most parts of the state. We will not take pre payments by phone or credit card holds by phone. The firearm will not be held until I actual reply to your message and confirm. If a firearm shows SOLD OUT or COMING SOON on the website we will be restocking the firearm as soon as one is available or when it is the season to restock the firearm. If the firearm shows SOLD OUT or COMING SOON go to our SEE OUR COMING SOON PAGE on this website to see if the firearm has been ordered for restock. There is a list of firearms in shipment to us. These firearms are first come first serve. No pre payments, cash or credit card holds will be accepted. It does not hurt to ask if you can special order a firearm. It might be we just chose not to restock. We offer consignment at 15% for items sold in the shop or 20% for items sold on Gun Broker plus any auction fees that apply. Online selling requires a lot of picture taking, time listing the items, answering questions, sending an invoice, processing payments, and shipping the item. If the item does not sell we will must perform a background check to return the item or items back to you. A $15 cash or $20 cc transfer fee will apply when the background check is done. Multiple handgun transfers will have an additional $15 cash or $20 cc fee applied. Items that were to be sold online that did not sell will be subject to Gun Broker auction listing fees (are not that much if it does not sell) and a $20.00 fee for my time listing the item in addition to the transfer fee. We do purchase firearms as well. We are not a Pawn Shop but we do purchase firearms. We do not offer this service to out of state residents. FYI If you drop any handgun off to a dealer in Maine you will not be able to get it back (if you are not a Maine resident) without sending it back to an FFL in your state. At that point a transfer would have to be performed. We can only sell or transfer handguns to state of Maine residents. In order to get your firearm back you would have to go through a background check. Background checks can only be legally done on handguns for Maine residents. Long guns are ok to perform storage and can be reclaimed only if the firearm is legal in your state of residence. We do not perform this service. We do offer shipping of firearms to licensed dealers. We prefer to ship handguns but we will ship long guns as long as we have a box available to do so. Long guns are much more time consuming to package (reinforcing the barrel end so it does not break through the end of the box) and there is a lot to think of when packaging them. If you want to package them yourself but leave the box open so I can access the make, model, caliber, and serial number that is a possibility. The length, width, height, and weight of a package can dramatically effect the cost of shipping. - The cost to package a handgun is $20.00 per firearm plus $25.00 for Priority shipping on a standard length handgun. Handguns must be shipped via a 2 or 3 day service. Handguns cannot be shipped via standard ground shipping. Insurance is about a $1.00 or $1.50 per $100 value. If you are shipping more that one handgun the shipping cost may change depending on several factors. - The cost to package a long gun is $25.00 per firearm (assuming I have the box to do so) plus $35.00 - $60.00 for standard ground shipping depending on the length, width, height, and weight of the package. Destination is also a consideration. Insurance is about a $1.00 or $1.50 per $100 value. If you are shipping more that one long gun the cost may change depending on several factors. You can package the long guns up yourself but I need to be able to pull them out of the packaging in order to get information off the firearms. We will only ship firearms to the lower 48 states. No shipping to Alaska or Hawaii. We must have a copy of your dealers license on file in order to ship a firearm to them. Firearms cannot be shipped to private party. Endangering the welfare of a child is a crime. If you leave a firearm and ammunition within easy access of a child, you may be subject to a fine, imprisonment or both. Keep firearms and ammunition separate. Keep firearms and ammunition locked up. Use trigger locks. When shipping a firearm in state we must ship the firearm to a licensed dealer. We must have a valid copy of your dealers license in order to ship the firearm. We will only accept USPS money orders for payment. No other forms of payment will be accepted. Maine residents will get the cash discount if they send a USPS money order. Please add 5.5% for state sales tax. Shipping costs can range from $15.00 for a average sized handgun (long barrel handguns or handguns that come in large cases may be more) to $20.00 or more for a long gun. When shipping a firearm out of state we must ship the firearm to a licensed dealer. We must have a valid copy of your dealers license in order to ship the firearm. We will only accept USPS money orders for payment. No other forms of payment will be accepted. Shipping costs can range from $25.00 for a average sized handgun (long barrel handguns or handguns that come in large cases will be more) to $35.00 or more for a long gun. We will only ship firearms to the lower 48 states. No shipping to California, Alaska or Hawaii. We do not ship to CALIFORNIA, ALASKA & HAWAII. Connecticut - No semi-auto rifles. Hawaii - No handguns w/ mags over 10rds. Massachusetts - No handguns. No hi-cap mags. No defense/clip fed shotguns. ­No semi-auto rifles. New Jersey - No firearms w/ mags over 15rds­. New York State - CURRENTLY NOT SHIPPING SEMI-AUTO HANDGUNS TO NEW YORK, No shipping to NYC. No handguns w/ mags over 10rds. Washington State - No M-16 bolts.